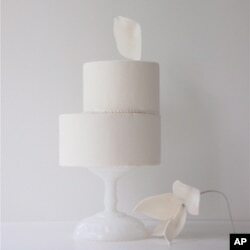 Maggie Austin’s elegant, custom-made wedding cakes feature her intricate sugar flowers, which are made with gum paste, an edible modeling dough. For most of her life, Maggie Austin was a ballerina. But when a traumatic injury ended her career, she found a different outlet for her impressive talents - creating one-of-a-kind wedding cakes that are edible works of art. Austin always loved to dance. But one day in 2006, while dancing with the prestigious Joffrey Ballet in Chicago, Austin experienced a sharp pain. Austin later learned she'd broken a small bone in her foot, an injury which wouldn't present a major problem for most people. But for Austin, it was a career ender. Devastated, she had to find another line of work. Since Austin’s other passion was baking, she signed up for a program at the reputable French Pastry School in Chicago, where she fell in love with the process of making intricate sugar flowers. After graduating, Austin moved to the Washington D.C. area to be near her sister Jessica. With Jessica’s help, she started selling sugar flowers to local cake makers, but then decided to make her own cakes. In 2010, the sisters opened their own business in a sun-drenched studio near Washington. Austin's speciality is elegant, custom-made wedding cakes. She applies the same dedicated discipline and attention to detail to them as she did to her dancing. Maggie Austin innovated the frills, or ruffles, technique. The frills are created using paper-thin layers of fondant, which is a sugar paste, and are individually applied to the cake. Her sugar flowers - which are made with gum paste, an edible modeling dough - are intricate and time-consuming. They are edible works of art that Austin's brides have come to cherish, particularly since they can last for a lifetime. Making individually-tailored cakes is a time-consuming and labor-intensive process. Even with the help of interns, it takes Austin an average of three days to create a single cake which she sells at an average cost of $2,000 to $3,000. Austin is inspired by everything from nature to high fashion. Her sugar oysters are uncanny replicas of the real thing, and she’s made cakes that are impressive renditions of the designer dresses that inspired them. But what Austin has become most renowned for is the frills, or ruffles, technique she applies to her more sophisticated creations. They are created using paper-thin layers of fondant, a sugar paste, which are individually applied to the cake. Their soft, elegant lines hark back to her years in the ballet. Maggie Austin's ballet aesthetic is evident in her creations. "A lot of times, with my cakes, there’s always an element that goes up and off to the right a little bit, angling upwards,” she says. “I think that there’s an aesthetic that is in ballet that can be translated into cakes,” she says. Today, the former ballerina enjoys creating cakes for her loyal, high-end clients. She also conducts workshops to teach cake enthusiasts how to make sugar flowers. Austin says she has finally come to terms with the premature end of her dancing career.